Fixed a bug where the list guid was not wrapped using curly braces. This made Microsoft Word fail to load the document information panel when you had a cross site lookup column in that library. To fix this, relink the lookup column again using the updated version. 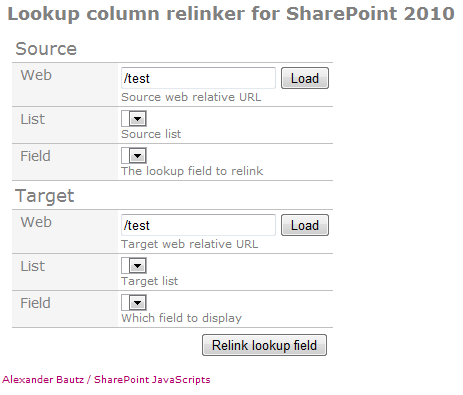 I have previously posted a solution that, among other features, lets you relink a lookup column. 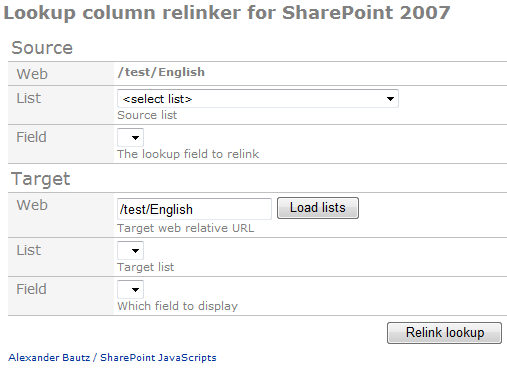 This article introduces a new tool that does lookup column relinking only. Get the code here, and ensure you use the correct version. The difference between the 2007 and the 2010 version is that in 2007, you must place the code in a web part in the site where the lookup column resides. You can target another site, but must run the code in the site where the column you want to alter is located. In the 2010 version, you can change the source web as long as you target a web within the site collection. If you like the solution, buy me a beer using the Beer button on the top right of this page. I am receiving the following error message when I enter the list details and as such the field drop down won’t work. Can you please help as would be an excellent tool to use. Message: Sys.ArgumentException: Value does not fall within the expected range. Use your own food. If you think Sharepoint is a good product, why do you host this blog on WordPress? I’m not sure what motivated this comment, but there are two main reasons: wordpress is free, and it is by far a much better blog platform than SharePoint. Any idea as to why I don’t get anything in the Source field dropdown – it doesn’t matter where I place the webpart (2007). Thanks for the article! Well written. Awsome tools! Works like a charm! Thanks a lot! With the 2010 version, when I click on ‘load’, I get an error that ‘SP’ is undefined. With the 2007 version, I get the list to select, but the ‘Field’ drop-down never gets populated. Hit F12 in Internet Explorer to bring up the developer toolbar. Look at the “Console” and report back here any errors. Hi, excellent bit of code. Works fine if I create a new document from within a document library, but if I upload or edit properties the lookup field simply has (none) as the only value. Any idea why? SP2007 relinker will never work. There BUG in source code. We cannot have code that is not working! Please check v1.1 to see if your problem is fixed. I recreated your issues in my setup and suspect the xml issue to relate to the browser version (IE 10 in my case). The “webUrl” is a plain old bug originating from the porting of the code from the 2010 version.